Blog Furniture is a proposal designed for... Blog Furniture is a proposal designed for children as well as for adolescents. It is a functional and modern chest of drawers... It is a functional and modern chest of drawers . It is equipped with 4 drawers, 1 door cabinet and 2 shelves. Presented chest of drawers has 7 drawers of... Presented chest of drawers has 7 drawers of different sizes, 1-door cabinet and two shelves. We present you the bed with frame and without a... We present you the bed with frame and without a mattress. The bed is equipped with two drawers and its total area is 90x200 cm. Bonell mattress is designed for 1-person beds. 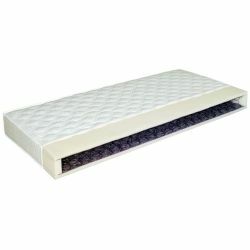 Bonell mattress is designed for 1-person beds. Bonell mattress is designed for 1-person beds. This is a collection intended for both children and young people. Undeniable advantages of this set are interesting and colorful stylistics, as well as functional forms of cabinets. A wide selection of cabinets allows you to create many interesting interiors. The furniture is made of a furniture board, and all the edges have been reinforced with ABS veneer. The collection uses transparent plastic handles. Furniture for self-assembly (in packages with clear instructions and accessories). 24-month warranty.